Artcultivator and Cultural Center "Rublevo" present the exhibition "Outskirts". The outskirts is not only a topographical concept, it is rather a phenomenon that accommodates the figurative signs of time and place. Performing a border function between the city center and the endless expanses spreading beyond the city limits, the outskirts combines the properties of these two elements. The conflict based on the relationship between nature and the urban environment is most acute here. On the one hand - the urban landscape, and on the other, perhaps, the field of blooming sunflowers, as in the work of Andrei Shatilova, or the almost alien world of industrial buildings of Yuri Tsarevsky. Artistic refraction of reality creates a kind of mosaic of visual images familiar to every resident of the metropolis. Characteristic for the suburbs objects begin to play the role of symbols. 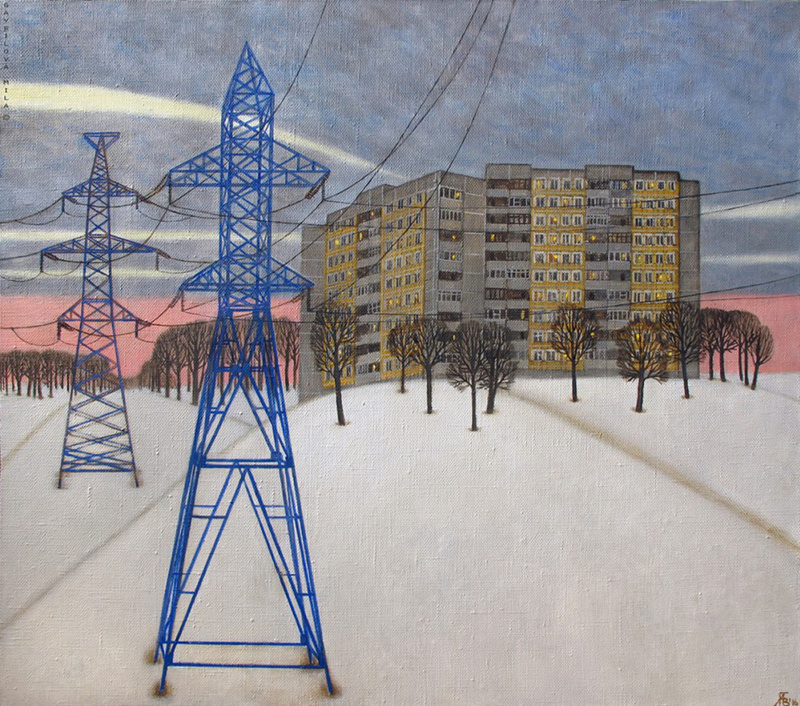 In the works of Mila Gavrilova, the "guards" of the outskirts of the power transmission tower, wires and, of course, typical panel houses become symbolic symbols. Routineness, lack of intrigue and eventfulness enhance the effect of recognition. The daily life of the plot takes on a dramatic sound in the intensely colored “Final” picture, with a deserted night bus stop. The theme of the transport highway connecting the center with the outskirts is also present in the works of Inna Volvak. Railway depots, old technical buildings - multi-layered and outgoing texture of time. Deserted streets in the light of lanterns, rare lonely passers-by, factory walk-through at the predawn hour, stalls with shawarma at the peripheral metro stations, permanent and temporary, eternal and ordinary get along in a series of night landscapes of Irina Bogdanova. The imaginative structure in Elena Gagarina’s work “The threads of fate” is due to the characteristic details of the depicted interior, the scenery outside the window and the mood of the invisibly present inhabitants of the house on the old outskirts of the city. Anna Brilling and Ivan Dedok in their full-scale sketches are imprinted on the old and endangered picturesque buildings that are living their past and passing away, which will soon be superseded by the upcoming urban construction. In the graphic series of Yuri Tsarevsky, the images of completely real industrial buildings are perceived as artifacts of other worlds, as phantasmagoria, born of the surrealist imagination. The exhibition will feature more than 30 paintings and drawings.